Going back to the my younger days, I only knew how to "enjoy" spinach in 3 ways: mom would either do a simple stir-fry with garlic, clear spinach soup with sliced onion (later on.... in my adult life... I added some dried anchovies (ikan bills) to it ) and cook spinach in coconut milk with some 'mee suah' (noodles) added in. Then spinach found its way into Hubby's lunch box... upto a point, he raised his white flag and surrendered, saying "Enough... no more spinach for me!!! Its tasteless"
We came across this recipe from an old cookbook sitting on my bookshelf gathering dust. Lesley Chamberlain ~ Russian, German and Polish Food and Cooking. Wash, rinse and soak baby spinach for 1 hour to get rid of sands (if any). Blanch spinach for 4 minutes. Strain and spinach and reserve the water. Saute chopped onion in butter until pale and slightly golden in colour. Add plain flour and cook for another a minute or two to cook the flour. Stir and bring back to boil. Remove from heat and add spinach into the pot. Using stick blender, blend until smooth. Add salt and pepper (to taste). Bring to boil until the soup thickened. Garnish with half of hard boil egg. Love how you put sliced boiled egg on top! SOOOO pretty! 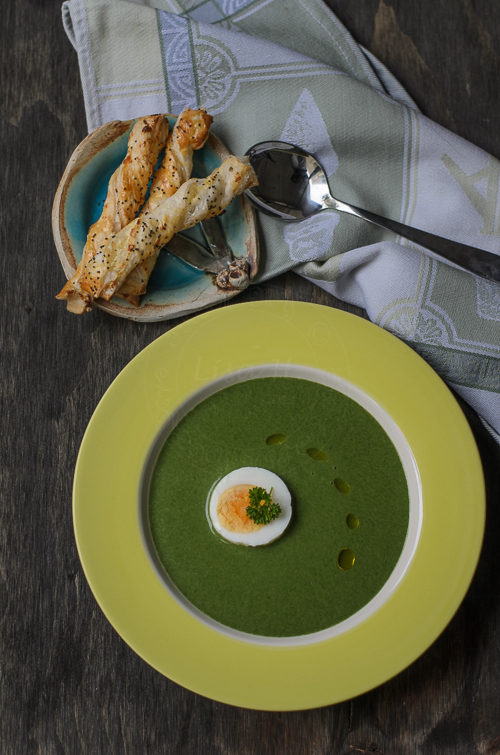 I love spinach soup, but looking at this photo, it's another level of spinach soup. I'd love to make this one for my family! It looks and sounds delicious! A wonderful soup. Love that garnishing boiled egg! The soup looks very tasty, Lisa. Yes, indeed so pretty looking with that slice egg on the soup. I never made soup like this before other than clear vegetables soup. 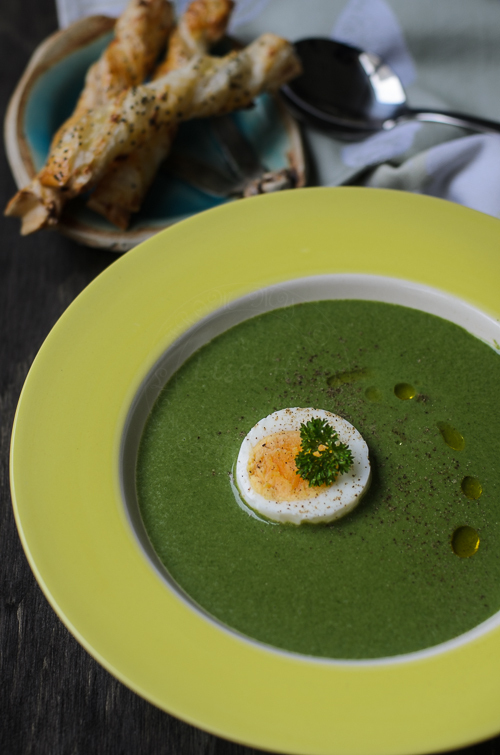 Love to give it a try....might get addicted to everyday spinach soup after my try, who knows? Good looking soups that is. 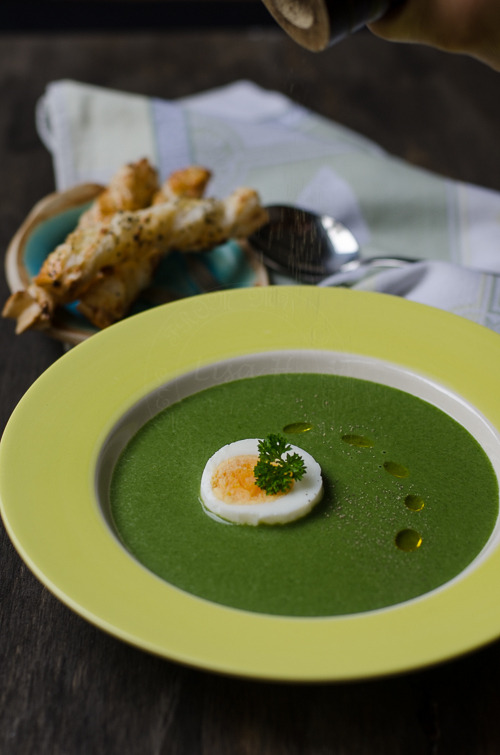 In Poland, we also put an egg in spinach soup. I love spinach and your soup looks and sounds fantastic. Great pics Lisa, they make my mouth water just by looking at them! This soup looks fantastic! I have never put spinach in a soup before, but I would love to try it!